Despite considerable progress, from expanding the league to luring David Beckham, Thierry Henry and Alessandro Nesta away from Europe, the MLS remains a quirky also-ran in the race for sports fans’ attention in North America. It is not for a lack of effort, that’s for sure. The deck is just stacked against the MLS in so many of the major markets. New York Red Bulls fight for column inches against the might of the Yankees and Mets (baseball), Knicks and Nets (basketball) and Giants and Jets (American Football). For Chicago Fire, New England Revolution, FC Dallas, Los Angeles Galaxy and several others, the challenge is similar. Toronto and Montreal have enough European roots to make football an intriguing option, but will always be ice hockey cities, first and foremost. Not so in Seattle, however, where the MLS has been embraced like a long lost son. The city’s sporting history is painful, with the Supersonics (basketball) being relocated to Oklahoma City and leaving a loyal fanbase in despair. That is a 31-hour drive, just for the record, cutting off even the diehards’ chances of seeing the team in action on a regular basis. For the Sounders, this presented an unmissable opportunity. Though the city does have an American Football team – the Seattle Seahawks – it was crying out for a way to fill the void left by the Supersonics. Why not an MLS team? And so Seattle has embraced the Sounders, with attendances rising year by year. More than that, they have raised the bar for the rest of the league, setting new average home attendance records in each of the past three campaigns. With a 2012 average attendance of more than 42,000, the club are on course to set another new mark. While other teams are desperately seeking ways to fill seats, Seattle are busy reaping the rewards of a packed CenturyLink Field. The Sounders pulled in a crowd of over 64,000 at the back end of last season and should come close to that number for their clash with local rivals Portland Timbers later this year. A crowd of over 55,000 cheered the team to victory over Vancouver earlier this month. The 12th man effect that the raucous home stadium provides has not been lost on the players. The fact that Seattle Sounders have emerged as legitimate contenders for silverware over the past few years has played its part – but this is largely a story of a city uniting around a sports team. Out of the misery of the Supersonics has come a love for football that has pulled communities together, re-enforcing the feeling that sometimes a sport and a city can come together as a perfect fit at the right time. By any measure, this has been one of the biggest successes of all the MLS ventures. With the playoffs rolling into sight, Seattle have again put themselves among the top MLS Cup contenders, with a squad brimming with quality. Class acts like Osvaldo Alonso, Fredy Montero and Mauro Rosales have made their mark while new signing Christian Tiffert, acquired from German club Kaiserslautern, has been an instant hit. The Sounders are currently hot on the heels of Western Conference leaders San Jose Earthquakes, with two months of the season to go. With one of the league’s best defensive records, it has been somewhat surprising that their struggles have come at times in the attacking third of the pitch. All that may change, however, as the attack gels and confidence soars. Previous seasons have shown that the race for the MLS Cup can be wholly unpredictable and swung by the slightest of factors, with favourites crashing out and unlikely contenders gaining momentum at the perfect moment. 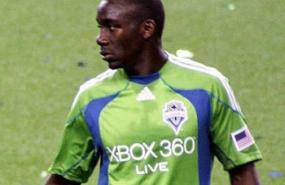 The race for silverware will be tight and tense but Seattle’s home crowd might just be the 2012 trump card.